Not many people see band directors as educators with an especially difficult career. For most, we don’t blame them. How would the average person know? But for others, like administrators, teachers and colleagues, it’s really a shame they don’t see it. While we can probably all agree that that the majority of educators put in a lot of hard work pouring into their students, the role of band directors is sadly often overlooked. Band directors put in more time and energy than most could ever imagine. And to top it off, much of it goes completely unnoticed, unaccounted for and unappreciated. Could band directors have the toughest job in education? 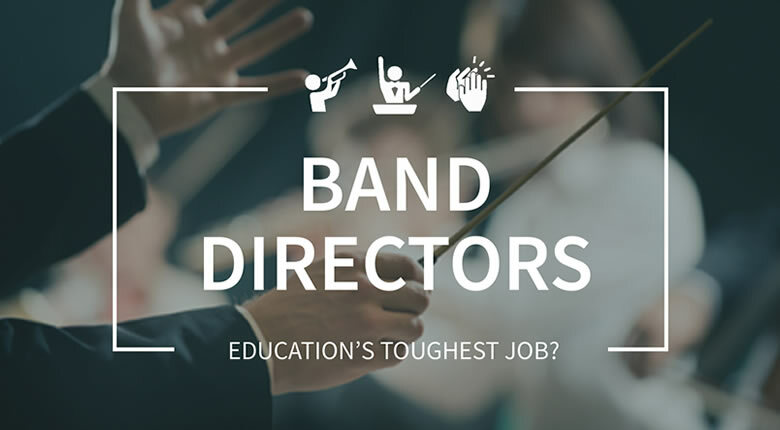 To help shed some light on the many responsibilities and duties of band directors, we’ve decided to compare band directors to other education professions. Our goal is NOT to put down any other role in education, because, let’s be honest, most are overworked and underpaid. Rather our goal is to help parents, students, colleagues and administrators understand and appreciate just how much music educators give to their school and community…and maybe cut them some slack if they mess something up. For the sake of this article, we are focusing in on the average band director, but let the record show that all music educators, including orchestra and choir directors, have many similarities. Band directors are teachers that jump through all of the same hoops as other teachers, such as keeping their teaching license current, but they also do much more than meets the eye. Let’s take a look at an average elementary, middle and high school teacher then the band director to see how they compare. Though the National Education Association (NEA) only uses this as an example, we think it’s safe to say that the average size of an elementary classroom is around 26 kids. And no, they are definitely are not paid enough. Teachers at the middle or high school level tend to have a different setup, in that they don’t see the same 26 kids all day, every day. Typically, they teach two subjects within their core subject. Let’s take a math teacher, for instance, who teaches three sections of geometry and four sections of Algebra 1. Though they must put more effort into grading, it could be argued that not as much effort must go into planning as the elementary teacher since there are only two subjects to prepare for (we know, we know…each class is different ;)). Now that we’ve taken a glimpse into the (heavy) workload of teachers, let’s compare that to band directors. Band programs vary widely from district to district, but that doesn’t mean the amount of work differs all that much. While some may be in bigger districts with a bigger program, they may have more directors to spread the work. Those in smaller districts may not have as many students, but they’re doing everything by themselves. To keep it simple, we’re going to talk about band directors in smaller districts. Some band directors cross disciplines and teach a choir or orchestra. The other two periods are usually taken up with some combination of general music, music appreciation or secondary ensemble, like a Jazz Band. Some even cross disciplines and teach a choir or orchestra. In case you didn’t catch that…even if we over-inflated the number of kids and even if the director doesn’t give a grade to every student, every day, they still likely do around 25 – 100% more grading and 40 – 250% more planning than other teachers. Band directors likely do 25 – 100% more grading and 40 – 250% more planning than other teachers. And if the two general music classes are actually other ensembles, the numbers would be even higher! In addition, many band directors are in multiple buildings. Because of this, they have multiple classrooms they are caring for and multiple principals they are answering to. Often, each principal wants the director filling a “duty” like the other teachers in the building, i.e. recess, lunch, etc. Band directors from larger districts could have assistants and not need to move between buildings, but could also be in charge of more than 500 students and have multiple high school ensembles (upwards of six concert bands and maybe even multiple jazz bands). We should also mention that most teachers have students assigned to their classroom. The music director must spend the necessary time, effort and energy to recruit children to be in music. If they don’t, they’re out of work! Hopefully, you’re starting to see how much work music directors do. Unfortunately…this is just the beginning. Band directors and football coaches both must keep a large group cohesive to be successful. You could also compare most band directors to a coach. Both have practices after school, “performances” outside of normal school hours and equipment they need to maintain. But in order to challenge the work of band directors, let’s compare them with the busiest and most renowned coach: the head high school football coach. The head coach of the varsity football team is arguably the most high-profile of all teachers/coaches in America today. The season begins during summer practices and two-a-days, though planning starts well before. With at least 10-12 games a season, coaches are preparing for a game a week. This entails making constant adjustments to the playbook in order to keep opponents off-balance. The head coach is called the “head” coach because they nearly always have paid assistant coaches who are likely also teachers within the district. They also have a lot of equipment to take care of (sleds, tires, cones, pads, etc. ), along with a lot of uniforms. Come game time, coaches have 11 different human beings that they need to keep working together in perfect harmony at any given moment, being mindful of substitutes on the sidelines. Surprisingly enough, band directors have a lot in common with high school football coaches, but they also manage much more. To best showcase all that band directors deal with, let’s split this into three sections: schedule, staff and drill. Band camp signals the start of the marching band’s season, though many bands have pre- and post-camps, along with regular rehearsals leading up to and throughout the season. Planning also starts well before – as early as the winter of the previous school year (in other words, not long after last season ended). Here are where some of the differences become more evident. In many states, like Ohio, the marching band is as much a part of each Friday night as the football team. They participate in the same 10-12 games a season plus playoff games. However, they also have their own “season”, normally having 5-12 additional performances. These come in the form of marching band festivals or competitions, community parades and even an end-of-the-season recap performance. It’s like having two seasons in one! Even after the fall season is over, things don’t stop there. Band directors have a number of special performances throughout the year, on top of football season performances. There are normally other performances throughout the year, like Memorial Day and Fourth of July parades and other special events in the community. Often, they have a pep band for each of the home basketball games, along with indoor percussion and/or winterguard seasons from November through April. …it lasts all. year. long. Not to mention, come performance time, they can have hundreds of students to keep in harmony every moment. There is no one on the bench! The band director’s staff is a different story, as well. Unless they are a part of a large enough district, the staff is often paid for by the band’s booster organization, not through the school under a supplemental contract. The positions are usually filled by recent high school graduates (certainly not other professionals). In many cases, they are only around for band camp. While having a large staff of professionals would be overkill in schools with small band programs, it could be a major reason the band is small. There is little support and band directors are stretched too thin. But often, there are 50-125 students in the marching band with little to no assistance from other teachers or staff. …often, there are 50-125 students in the marching band with little to no assistance from other teachers or staff. It’s only in the larger districts where they may have assistant directors and staff to help. But while the football coach may oversee 50-100 kids, band directors can find themselves responsible for upwards of 450 kids (and likely more in some places)! Lastly, we can talk about the marching band drill – similar to the coach’s playbook. The big difference is that band directors introduce an entirely new “playbook” every year in competitive bands, with upwards of 100 or more drill sets, or even multiple smaller shows of 10-25 sets at every home game for show bands. Often, they try to outsource the drill writing, but many directors don’t have the resources to do so, so they do it all themselves. Athletic Director speaking to his students. Band directors can be compared to athletic directors as they both must keep up with compliance, scheduling and fundraising. We’re definitely getting into territory that may get you scratching your head. You’ve probably never thought of your band director as an athletic director. The athletic director may be a teacher in the district while being paid to be the director through a supplemental contract. Often they are more of a hybrid position – teaching half-time and directing athletics half-time. However, it’s not uncommon to find districts that employ a full-time, non-teaching athletic director. And the work they do certainly warrants the full-time status. They make sure schedules for different sports are set well in advance and busses are scheduled for those teams and events, while also making sure fields and venues are kept in good shape at home. Athletic directors are also responsible for leading the athletic booster organization and all that comes with that – caring for the spending of the budget, fundraising, leading meetings, organizing volunteers, etc. In addition, compliance with state rules and regulations must be tracked and kept up (in Ohio, it’s the Ohio High School Athletic Association). Student-athletes have files of information like physical exam forms, eligibility requirements, awards, etc. that need to be maintained. And don’t forget that officials need to be scheduled for each game! While band directors don’t always have as many ensembles as the athletic director has sports, they are responsible for all the same things (and many times, for as many or more kids). They need to set the yearly schedules for each of their different ensembles, making sure bussing is available for each activity away from campus. Being a leader of the booster organization usually means at least one night each month away from home, on top of all of their other commitments. That’s not to mention the constant communication, planning, and fundraising that happens outside of meetings. Being a leader of the booster organization usually means at least one night each month away from home, on top of all of their other commitments. And yes, band directors have files on every student with similar information regarding health, eligibility, and awards that need to be maintained. In Ohio, the Ohio Music Education Association – in conjunction with the National Association for Music Education – is the body that provides professional development opportunities, rules and regulations for both marching, concert and solo/ensemble contests. The organization also helps maintain music education standards that align with government regulation. Directors often pay for their membership out of their own pockets. Most band directors must serve as their own assistant. The athletic director nearly always has someone else working with him or her to type letters, make copies, lick envelopes and answer phone calls. It’s a full-time job. Of the 85 districts we currently work with, we know of one band program (one of the largest in the area) that has an admin assistant. One other has a part-time volunteer to help with these sorts of things. In the vast majority of the music programs big and small, the director does all of this work themselves. We’ve overloaded you with information on the roles of band directors, but truthfully, it’s still only scratching the surface. Take a look at the many hats of a band director by our friends at Tone Deaf Comics. Notice we didn’t even bring up the importance for band directors to keep up with copyright law, learn basic instrument repair, or act as a librarian for all of the school’s music. We also didn’t mention that they rarely have the largest supplemental contract in a given district, though anyone would be hard-pressed to present a more compelling case for any other teacher on a supplemental. Please cut your band directors some slack. We know other teachers might complain if you don’t make them have a “duty” or turn in paperwork at the same time as everyone else. But take a moment to educate them on all the director is doing for the betterment of your school that they likely don’t see. Most importantly, please do what you can to support the arts. Many band directors get very little district money for new equipment or keeping instruments in playing condition. They’re also often relegated to “special” status as if they’re not a “real teacher or teaching a “real” subject. Help change that perception. We know that you’re under immense pressure to have your school perform well on standardized tests (don’t get me started…), but please try to learn what your music directors are doing to help you with that. You can start here – that’s just the tip of the iceberg. And please don’t make them the first ones on the chopping block if the next tax levy doesn’t pass. Please pick up your children on time after a concert or rehearsal. Your child’s director has long days as it is – please don’t make it longer for them. Volunteer your time and expertise to help. Even if you don’t know what you could do, ask! We have no doubt your child’s director will be able to come up with something. Also, please pay attention to all communication that comes home. Missing out on the right drop-off time, concert attire or meeting date causes many issues for band directors. It is an extra stressor for them to have to respond to emails or phone calls when they already sent home the information many parents are contacting them about. Finally, support your school’s tax levies. Frequently, your directors are some of the first on the chopping block (though hopefully, we can change that). You’re the reason band directors work long days and nights – they love your love for music. You can help them out in a major way by listening, learning and enjoying the process of becoming a musician. Simply follow instructions and do as your director asks. Even volunteer to move equipment to the auditorium on concert days or help with passing out music. The less stress you can cause your director, the more enjoyable rehearsals and performances will be. And practice! (Check out this article on Bullet Proof Musician on Why Practicing, Practicing from an Early Age is so Important). You’re the reason band directors work long days and nights – they love your love for music. Think about it – other students have some other class while you are in band. Their homework likely involves reading chapters of a textbook, writing papers, etc. Your homework for band or orchestra? You get to play music! Take advantage of that! And if your director could step on the podium in front of a room full of students who practice at home, it makes all the difficult aspects of their job that much more worth it! We see you, we appreciate you. Keep doing what you are doing. If you are just jumping onto this crazy ride, be sure to check out our 5 Survival Tips for the First year Music Director. Whether it’s your first year or you are a seasoned veteran, take a break every now and then and don’t be afraid to respectfully advocate or yourself. We promise to do our part spreading awareness and pushing for you to get the help you need and the salary you deserve. So what do you think? Do band directors have the toughest job in education? Band directors – what did we miss? How can people help? Parents, students, and administrators – do you have a greater appreciation for your music director(s)? Let us know in the comments!